Each line on the list is called a “table entry”. Tables can be grouped together into a “table set”. This example table set only has a single table, which has 3 table entries. It doesn’t have a name, or any special formatting, but that’s all you need to get going! The main screen lists all of your table sets. 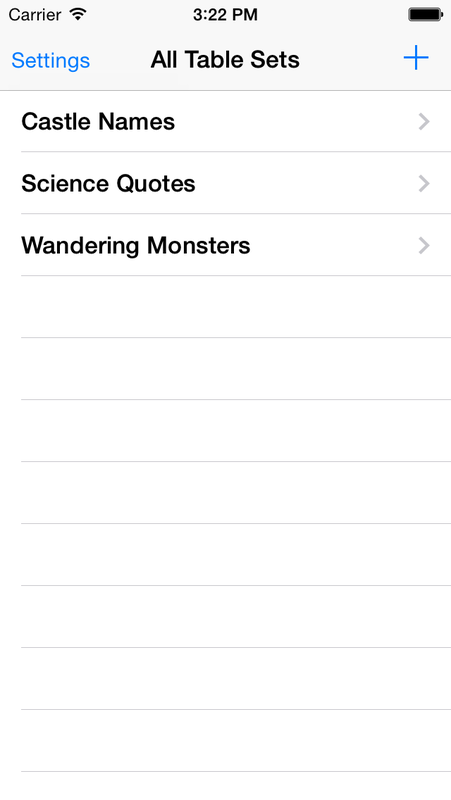 You can filter this list, and change the order, by tapping ‘Settings’. 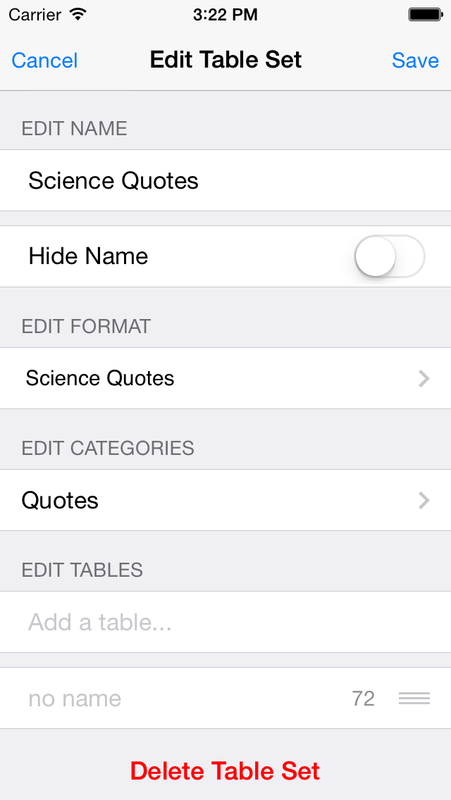 Create a new table set by tapping the ‘+’ button (See Editing Table Sets below). Otherwise, just tap the name of the table set you want to see. You can load table sets into the app by synchronising text files using iTunes, opening text file attachments from Mail, or opening text files from Dropbox or similar services. If you have loaded a table set whilst the app is running you can refresh the display by pulling the whole list down. This is the main view of a table set. Tap the screen to refresh the display and see a new, randomly chosen entry from each table in the table set. Swipe left and right to switch to the next or previous table set in the list displayed on the previous view. Note that this list can be filtered by setting the categories on the ‘Settings’ page. Edit the table set by tapping the ‘Edit’ button. This view allows you to edit a table set, or create a new one. Tap the name to edit it – if it has no name then tap ‘Add a name…’. This name is displayed in the navigation bar on the main view. Note that hidden tables (see below) are listed in grey. You can hide the name of the table set in the display view by turning ‘Hide Name’ on. The name of the table set is displayed in the navigation bar, so you may not want the name to be shown twice. Tap the name of the table set under ‘Edit Format’ to change the overall formatting of the table set. The name is displayed using the current format to give you a preview. See Formatting. The ‘Edit Categories’ section lists the categories that have been applied to the table set. If no categories have been applied then it will read ‘Add a category…’. Tap this to go to the ‘Select Categories’ view. The ‘Select Categories’ view shows a list of all categories in all table sets in the app. The number of table entries in a table is also shown. Note that some tables may not have been given names. These are shown as ‘no name’ in the list. If you want to create a table with no name you must first add a table using a temporary name, which you then delete in the ‘Edit Table’ view (see below). Tap ‘Save’ to preserve all your changes to this table set, including any changes made to its tables and their table entries. The app will return to the Display View. Tap ‘Cancel’ to discard all changes and return to the Display View. If you were creating a new table set then tapping ‘Cancel’ will discard the newly created table set and return to the Main View. Finally, you can delete a table set by tapping ‘Delete Table Set’. A confirmation dialog will pop-up – note that if you tap ‘Delete Table Set’ then the table set (and all of its tables and their table entries) will be removed and cannot be recovered. This view allows you to edit an individual table. Tap the name to edit it – if it has no name then tap ‘Add a name…’ Note that the table does not have to have a name, but a name (and a unique one!) is required if the table is to be linked to (see below). Tap the name of the table under ‘Edit Format’ to change the overall formatting of the table. The name is displayed using the current format to give you a preview. 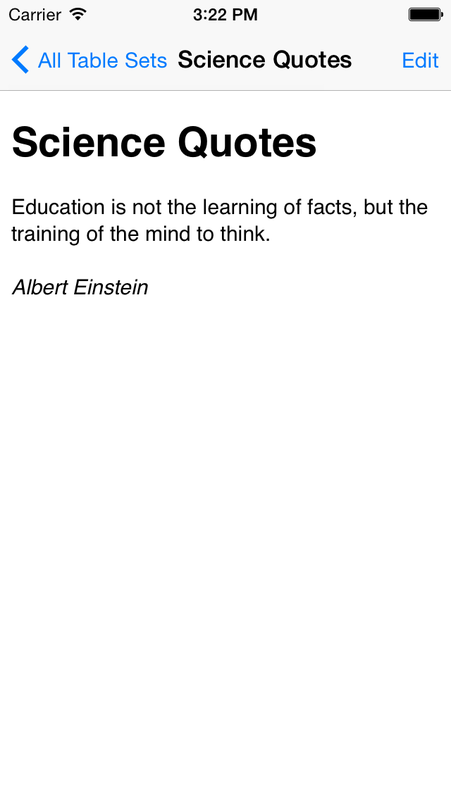 See Formatting. Note that this formatting will override the formatting that has been set for the table set (above) but only for this particular table. Turn on ‘Hide Table’ to suppress output of this table on the display view. This is useful if you are linking to the table as part of another table, and don’t want the table to appear twice. Hidden tables are listed in grey on the Edit Table Set view. 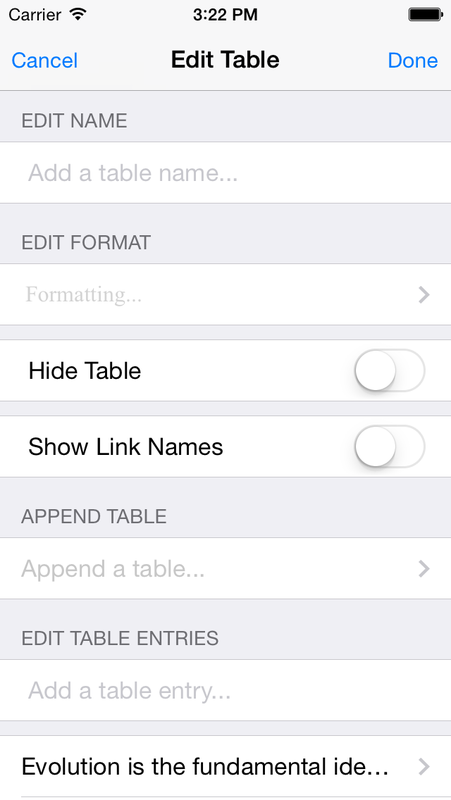 Tap ‘Show Link Names’ to display the names of any linked tables. Usually this is not necessary, and clutters the display, but it might be useful if you are working with a complicated set of links and need to confirm what is being displayed. The app will then choose one of the table entries at random, follow the ‘link’ to the appropriately named table and process the appropriate table. Random Tables allows you to append the results of one table directly to the output of another. In this case the name of the appended table is not displayed (as there is nowhere for it to go). Often you will want to hide the appended table to prevent it being displayed twice. The weighting of the table entries (see below) is also shown. Finally, you can delete a table by tapping ‘Delete Table’. A confirmation dialog will pop-up – note that if you tap ‘Delete Table’ then the table (and all of its table entries) will be removed and cannot be recovered. This view allows you to edit an individual table entry. Tap the table entry field to edit it. You can add any text you want to – even HTML/CSS (see Formatting). meaning that there is a 2 in 3 chance of getting ‘apple’, and only a 1 in 3 chance of getting ‘banana’. 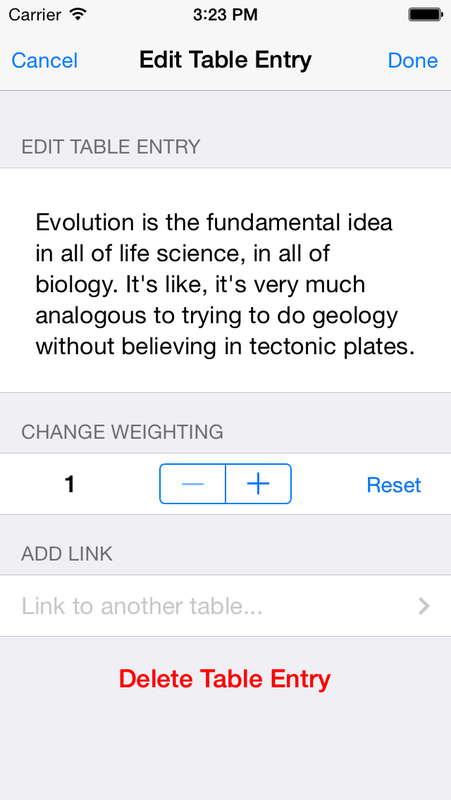 Tap the ‘Link to another table…’ to display a list of all the other tables in the table set. Tap one of these tables to make the table entry a link to this table (see above). The table entry text will be preserved but you won’t be able to edit it until you tap on the ‘Link to’ entry and un-check the linked table. Note that it is only possible to link to tables that have a name. Finally, you can delete a table entry by tapping ‘Delete Table Entry’. A confirmation dialog will pop-up – note that if you tap ‘Delete Table Entry’ then the table entry (and all of its properties) will be removed and cannot be recovered.